In 1995, I became the third owner of WindSong, a 1970 Ericson 35 Mk II sailboat. In the past fifteen years, I have sailed her to Isthmus Cove at Santa Catalina Island over fifty times, often with adventure, but always in safety. What makes a Bruce King Design such a pleasure to sail? First is the sail plan, with plenty of power, even in even a moderate breeze. Second is 5000 lb. of lead, encapsulated in her sleek fin keel. Working together, even under extreme conditions, those two aspects assure safekeeping for captain and crew. In high winds or heavy seas, a King design incorporates such a strong “righting moment” that there is little danger of a knockdown. Even on those rare occasions when her semi-balanced spade rudder shall breached the surface, I know I am in God's hands, and therefore shall not fail. Short of a gravitational eclipse, there is no prospect of turning-turtle. Even when the tattles tail and all sheets are to the wind, a Bruce King yacht shall carry you home. Thank you, Bruce King. Known for designing the most beautiful sailing yachts of the past fifty years, some ask if Bruce King shaved performance in favor of good looks. An observer of Bruce King designs from the 1960s until his retirement in 2004 knows that early in his career, he "got it right". Over the years, he modified his original designs no more than necessary to execute the requirements of any particular project. As time passed, he advanced, rather than hackneyed his developing design aesthetic. Once delivered, Ericson Yachts owned the designs. To his chagrin, Bruce King's artistic and aesthetic control ended when the design left his drawing board. Hence, the chop-shop stern modifications on various later model Ericson sailboats. Whether it was the “Classic Plastic” Ericson 35-2 or one of his later super yachts, we see a gentle evolution of form throughout King’s career. In a testament to the young Bruce King’s abilities, almost 600 of the 7000 yachts attributed to his designs were Ericson 35s. With an overall length of 34’ 8” and only a 27’ 10” waterline, why would the designer give up almost five feet of boat length to the bow and stern overhangs? 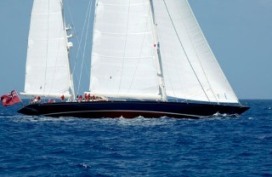 While heeling moderately under sail, the leeward waterline of the Ericson 35-2 lengthens to nearly thirty-two feet. 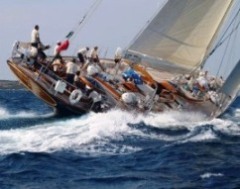 In the sailing realm, longer waterlines equal greater hull speed. Combining that clever design element with a concentration of weight amidships minimizes the “mass moment of inertia”. In plain English, an Ericson 35 sailor can find peace in the three dimensional time-space reality we call ocean sailing. If you like your peace with a dash of excitement, then WindSong is the boat for you. Known as a racer/cruiser in its early days, most Ericson 35 - 2 sailboats have now transformed into coastal cruisers or unique liveaboard sailboats. Either is a task for which the boat is ideally suited. From Marina del Rey to Two Harbors at Santa Catalina Island is over thirty nautical miles. On many of my transits to the island, I overhauled and passed boats larger and longer than mine. With the élan of a racer and the accommodations of a cruiser, there is no better boat to spend a few leisurely days and nights on a mooring at Isthmus Cove. Finding myself suddenly single in 2003, I became a live-aboard in Marina del Rey, California. After a few sleepless nights, staring at the ceiling of the cabin, I recalled that living aboard WindSong was part of the adventure that I sought in life. As early as 1972, on a visit to the LA Boat Show, I decided that I wanted to live aboard a sailboat. In 2003, with homelessness as my alternative, it took me a while to become comfortable with my dream come true. During the next two years, I spent more hours aboard WindSong than ashore. Rekindling my executive recruiting business, took many hours of telephone and computer time. By late 2004, when I rejoined my recurrent odyssey to the Four Corner States, WindSong became less active as a cruising boat and more of a floating haven for me. By 2007, I had moved on to a new and rewarding relationship with an other. Despite our mutual love for WindSong; we spent only occasional weekends aboard. In 2011, over forty years since her launch in Orange County, California, WindSong calls out to a new owner. She is a good boat overall, so in another forty years, we hope that an interested party will Google, “Ericson 35 WindSong” and read this epistle. If the year is 2048, I will be 100 years old. Even then, I will be happy to discuss all that I know about WindSong and what makes her a great yacht. Author's Note: In May, 2012 I sold the boat WindSong. She now has a new home in San Diego Bay, California. Look for her sailing there, or perhaps anchored at Two Harbors, Catalina Island. In September 2017, I found a link to "Windsong, 1970 Ericson 35-2 for sale" in San Diego, California. Although I have not seen her since 2012, I hope she is still ship-shape and ready to sail.